The College captures the first patent for asphalt skis. More likely to kick up sparks than snow, the asphalt skis developed on Lafayette’s campus a few years ago have reached a new summit by receiving the first-ever College-sponsored U.S. patent. In their quest to simulate an authentic downhill experience in the heat of summer, members of the Class of 2014 and the ski team set out to build skis that would replicate on asphalt the same motions and sensations experienced on the slopes. “We were inspired by our love of and passion for skiing and finding a way to ski in the summer,” says John Burns ’14. Setting up shop in Acopian Engineering Center in fall 2013, Burns and fellow mechanical engineering major Patrick Reilly ’14 headed to Home Depot for wood, fiberglass, epoxy, and more cinder blocks than their compact car could carry. “We started to build a prototype, and using the cinder blocks we pressed together three combinations of wood and fiberglass for flexibility,” Burns recalls. We were inspired by our love of and passion for skiing and finding a way to ski in the summer. Tobias Rossmann, assistant professor of mechanical engineering, who teaches entrepreneurship by bringing together students representing a mix of disciplines, helped along the way. “During the early part of second semester of this project, after several design reviews, I started to feel that the idea that the students were pursuing was innovative enough to think about applying for a patent,” Rossmann says. 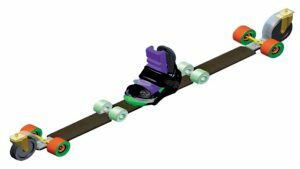 Reilly says asphalt ski products on the market act essentially like an inline skate but don’t allow for the sideways or lateral motions skis use to carve the snow, sending a satisfying swoosh of powder in their wake. “After we created the right stiffness for the skis, we added two swivel wheels on either end, like on a rolling chair, and that gave us what we were looking for—to slide in any direction,” says Reilly, an aerospace engineer at Sikorsky Aircraft Corp. in Stratford, Conn. It was the addition of the wheels that ultimately got the attention and backing of the College. Students, administrators, and Rossmann then worked with outside patent attorneys to prepare the provisional patent application, which was filed in December 2014. The College earned the patent this January for what students dubbed the Yette Ski. “We discussed that this first, student-driven patent would be a great example of the entrepreneurial activities on campus and the success of a multi-disciplinary product design group,” says Rossmann. As one of the economics majors on the team, Dan DeSena ’14 performed market research to support the patent application. “The first item we addressed was what skiers did during the summer to stay in shape,” says DeSena, a senior financial analyst for Estée Lauder Companies Inc. Under the agreement with the College, which funded the patent application, the six students who were involved in the project and are listed as the inventors would receive 60 percent of the profits if the Yette Ski is ever marketed; the College would receive 40 percent. Members of the team that developed the Yette Ski in the photo above, from left, Patrick Reilly ’14, John Floyd ’14, Dan Desena ’14, Keaton Holappa ’16, Peter Hauke ’15, John Burns ’14; at rear, Prof. Tobias Rossmann.